Now Halloween is over, what do you do with your finely carved pumpkins? Well you can eat them of course - like the newest arrivals at Longleat. 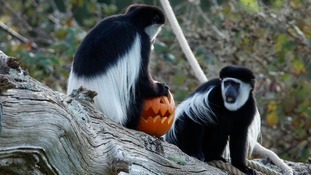 The seven-strong colony of colobus monkeys have taken over the island at the Wiltshire Safari Park, which was previously occupied by Nico the gorilla, who sadly passed away earlier this year. 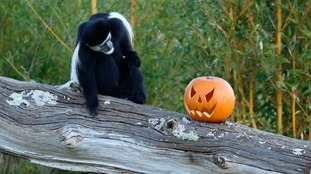 The primates are originally from East Africa and have a diet of fruit, berries, leaves and seeds. They happily tucked into the pumpkins, specially carved with Halloween faces by one of the keepers. We knew they liked squashes and gourds and thought pumpkins would make the perfect autumnal housewarming gift. One of the team carved them into appropriately-spooky looking Halloween faces but it didn’t deter the monkeys who actually seemed to be even more interested in them and finding out what was inside. Over the past few weeks, families have been busy carving their own pumpkin creations to celebrate All Hallow's Eve. All those creations certainly produced a LOT of mush - which was perfectly edible.The campaign group Hubbub claims 18,000 tonnes of edible pumpkin ends up in the bin each year. That's the same weight as 1,500 double decker buses. It runs Pumpkin Rescue every year to teach people about alternatives. Don't let your pumpkin end up in landfill! There are lots of options but don't forget to remove any candles or decorations first.